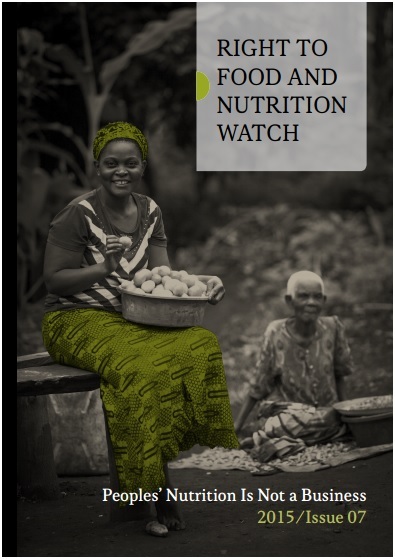 The report Right to Food and Nutrition Watch was published on October 2015. Several IBFAN members, namely Patti Rundall, Lida Lhotska, Marcos Arana, and Xaviera Cabada, contributed to it. In her article entitled The ‘Business of Malnutrition’: The Perfect Public Relations Cover for Big Food, IBFAN Global Advocacy Spokesperson, Patti Rundall, refers to food corporations engaging in partnerships with Government institutions and NGOs to assess undernutrition and overnutrition, initially caused by the malevolent marketing practices of the same food corporations. CSR programs have also been voluntarily adopted by various multinationals to engage with the cause. However, such alliances and initiatives have become a mechanism for corporations to avoid negative reputation, thus public relations strategy. This has resulted opposite to undermining the impact of processed foods and being facilitated with new business opportunities. As an insight on The Origins of ‘Multi-Stakeholderism’—Why Words Matter, Lida Lhotska highlights how transnational corporations make their way through platforms such as Scaling Up Nutrition and the Global Alliance for Improved Nutrition due to the overused concept of “stakeholders”, which allows these corporations to participate in decision-making and can lead to conflict of interests, resulting in diverted funds. Marcos Arana Cedeño and Xaviera Cabada showcase the negative impact of ‘multi-stakeholderism’ in their article on Nutrition Policies Taken Hostage by Multinationals and Conflicts of Interest: The Obesity and Diabetes Epidemic in Mexico. Due to misleading marketing and advertising of processed and unhealthy foods in recent years, children in Mexico have suffered of an exponential increase in obesity and diabetes. In order to redeem and counteract these effects, the Government and multinational food corporations have partnered, resulting in different initiatives within the framework of the National Crusade against Hunger (Cruzada Nacional contra el Hambre, CNH). CNH utilizes public funds to provide Cards Without Hunger (Tarjetas Sin Hambre) to people living in poverty, so that they can acquire listed food products. However, a large part of these listed food products are produced by the multinational food corporations, which means that public funds are used to somehow “sponsor” private companies. In all the above scenarios, the interventions aimed at tackling malnutrition are based on industrial food products which allows food corporations to profit from incorporating and promoting more processed foods into the market and thus replacing local foods.